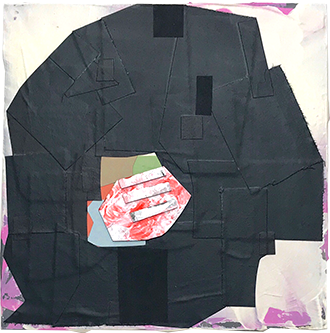 David Willburn, Indoor, Don't Tell (SL ll), 2018, acrylic, muslin, craft foam on panel 11.5" x 11.5"
Kirk Hopper Fine Art is pleased to present our summer group exhibit, Prohibitor, featuring artists Jorge Alegría, Sara Cardona, Matthew Bourbon, Michael Frank Blair, Brian Florentin, Lily Hanson, Lucas Martell, Shayne Murphy, Fabiola Valenzuela, David Willburn, and Ushio Shinohara. Prohibitor features a variety of abstract work from a diverse group of artists whose work focuses on the familiar and foreign. The works reflect a remote, almost baleful attitude of fragmentation. Prohibitor aims to mimic the current climate society is facing with moments of hope reflected through formal elements. Sara Cardona was born in Mexico City. She lives and works in Dallas and received her MFA from the Tyler School of Art in Philadelphia. She is also a graduate of the Skowhegan School of Painting and Sculpture residency program in Maine. Cardona is a past recipient of the Dallas Museum of Art Kimbrough Award and a Rockefeller-Fideicomiso Grant to study colonial wax-based masks and sculpture in Mexico City. Her work has been included in exhibitions at the Dallas Center for Contemporary Art, the Jones Center in Austin, Gescheidle Gallery in Chicago and abroad. Sara Cardona has fifteen years of experience teaching in the Humanities for Richland College in Dallas and is a PhD candidate in the Aesthetic Studies Program at the University of Texas at Dallas. In 2015 she completed a research internship at the Amon Carter Museum through support from the Center for Interdisciplinary Studies of Museums at the Edith O'Donnell Institute of Art History. Born in Fort Stockton, Texas, David Willburn lives and works in Fort Worth, Texas. He earned an MFA from Vermont College of Fine Arts (Montpelier, VT). His work has been shown nationally and internationally at venues including Dallas Contemporary (Dallas), San Diego Art Institute, University of Art and Design (Helsinki, Finland) Museum of Arts and Design (New York), Union Gallery at University of Wisconsin (Milwaukee), Museum of Contemporary Craft (Portland, Oregon), and Galleri Urbane (Dallas). Lily Hanson grew up in New Hampshire. She received her B.A. at Hampshire College in 1995 after majoring in sculpture. She moved to Dallas in 1998 to attend SMU and received an MFA in sculpture there in 2000. She has had a studio in Dallas ever since. Hanson received the Dozier Travel Grant from the DMA in 2007. Her work has been exhibited at the Conduit Gallery, And/Or Gallery, Re Gallery, and Central Track in Dallas. 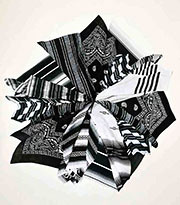 She participated in the first Texas Biennial in Austin, and has shown at the Lawndale Center for the Arts in Houston. She currently teaches sculpture at SMU and is a private chef, and has a studio in East Dallas at the Shamrock Studios. Shayne Murphy received an MFA in Drawing and Painting from the University of North Texas in 2013. Before attending graduate school he worked several years as a graphic designer for notable agencies in the Houston area. Murphy has exhibited most recently with Anya Tish Gallery (Houston), Cris Worley Fine Art (Dallas), Kirk Hopper Fine Arts (Dallas), Blue Star Contemporary Museum (San Antonio), and Salt Fine Art (Laguna Beach, CA). His work has been featured in publications such as New American Paintings, Hi-Fructose, and Arts+CultureTX. In 2014, Murphy completed the year-long Artist Studio Program residency at Lawndale Art Center in Houston, Texas. His work can be found in private and corporate collections, including Houston's Bush Intercontinental Airport. Ushio Shinohara (nicknamed "Gyu-chan"), is a Japanese Neo-Dadaist artist who has lived and worked in the United States since 1969. His parents, a tanka poet and Japanese painter, instilled in him a love for artists such as Cézanne, Van Gogh and Gauguin. Known for his boxing paintings, which are artifacts of his performances, Ushio works in several mediums including painting, printmaking, drawing and sculpture. His bright and frequently oversized work has exhibited at prestigious institutions internationally, including the Hara Museum of Contemporary Art; Centre Georges Pompidou; the Guggenheim Museum, New York; the Japan Society, New York; the National Museum of Modern Art, Tokyo; Leo Castelli Gallery; the Museum of Contemporary Art, Los Angeles; the Metropolitan Museum of Art, Seoul; and soon at the Dallas Museum of Art and the Tate Modern, among others. Ushio and his wife of 42 years, Noriko, are most recently known from the Academy Award-nominated documentary Cutie and the Boxer. This documentary explores the history of the couple's often tumultuous marriage and their lives as artists. Matthew Bourbon is an artist and writer. Originally from the San Francisco Bay Area, Bourbon earned separate undergraduate degrees in Studio Art and Art History from the University of California at Davis. Relocating to New York City, Bourbon earned his MFA from the School of Visual Arts. Since then, his art has been exhibited nationally and internationally. Bourbon has been nominated for and won numerous awards for his work. Recently he was awarded the Otis and Velma Davis Dozier Travel Grant by the Dallas Museum of Art to conduct research in Japan, and he was named an Institute for the Advancement of Art Fellow at the University of North Texas. He has also been selected twice to be included in the Texas Biennial and in New American Paintings, where his work was highlighted as a Juror's Pick. Bourbon is currently an Associate Professor of Art at the University of North Texas' College of Visual Arts and Design. He is also an art critic and contributor to Art Forum Online, Flash Art, ArtNews, New York Arts Magazine, and Glasstire, and served for several years as the regional editor for the journal Art Lies.